Kick your shoes off and relax by slipping on one of these pairs of feminine terry cloth towel slippers that have been embroidered by Pinat Eden. These come in two lovely designs and will fit most shoe sizes. Terry cloth towel slippers don’t have to be boring with these embroidered towel slippers from Pinat Eden. These come in off-white terry cloth that’s been trimmed in white lace or in cream with a lace and silver stud design, giving them a new and elegant twist on a simple idea. The easy slip on and non slip design makes these both practical and comfortable and the terry cloth makes them absorbent so they’re also great for use after your shower or bath, or even at the beach or at the swimming pool. The terry cloth makes these warm, but they’re also lightweight, so they won’t feel like shoes. These will fit shoe sizes 35-41, so they’re great for almost everyone. 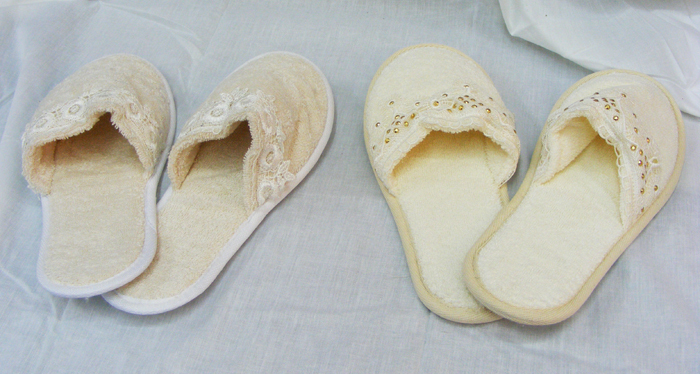 Pinat Eden’s embroidered towel slippers are just the thing for relaxing with an added feminine touch. These are so pretty, when you wear them, you’ll almost feel like you’ve just checked into a luxury hotel! And as an added bonus, you can get them personalized for free as one of Pinat Eden’s “Embroidered with Love” collection.